Netminder Janis Auzins returns for Phantoms at MK. 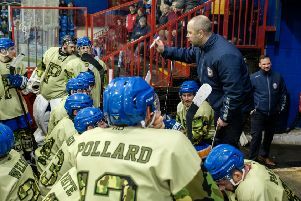 Coach Slava Koulikov has told his Phantoms players to take inspiration from their English Premier League Play-Offs triumph when going in search of another trophy tonight (January 13). The city team travel to face fierce rivals Milton Keynes in the first leg of an EPL Cup semi-final (7.45pm) as they aim to take a big step towards a second trophy in as many seasons. Marc Levers should be back for Phantoms in MK. But they hit the road to Buckinghamshire in their worst form of the current campaign. Phantoms have lost five of their last six games and have also been beaten in all five league clashes against Lightning – the last of which arrived at Planet Ice last Sunday (January 10). But Koulikov is not concerned by that poor record and has instead urged his men to take belief from their play-off heroics last Easter. Koulikov said: “We want to win every game we play and tonight will be no different, but we know that can’t always happen. “The most important thing in a first leg is not to get blown out, but ensure we bring the tie back to our home ice in a good position. “The fact we have not beaten Milton Keynes this season does not bother me at all. “Four of the five games have been very tight. Two went to overtime and two others were one-goal games until deep in the final period. “Last season we went to the play-offs and beat the outstanding team in the league, Telford, in the semi-finals. “No disrespect to MK because they are a very, very solid hockey team, but they are not in the class of that Telford side. Star netminder Janis Auzins will return after being rested for the league clash last Sunday, which ended in a 2-0 reverse. Defenceman Scott Robson, who has missed the last three games, and forward Marc Levers, who sat out Sunday’s fixture, are expected to be fit. The second leg of the EPL Cup semi-final is at Planet Ice next Wednesday (January 20). Basingstoke and Guildford contest the other semi-final this month.